Choosing the Right Machine Stretch Film for Your Application? Does the load have special requirements? Where is the pallet being shipped? Continue reading to learn more about each of the most important factors to consider in choosing the right machine stretch film for your application. As the easiest type of load to wrap, type A loads offer a uniform shape and have very few film puncture points. In addition, the size of the load closely matches the size of the pallet. These loads are most commonly seen in warehouses or distribution centers where the same product is repeatedly prepared for shipment. Type B loads are less uniformly shaped than type A loads. In many instances, type B loads do not match the pallet size, or they have an irregular stacking pattern. As a result, many type B loads have several puncture points. If you are wrapping a type B load, you should closely consider the film you choose, especially at high film application tensions or at high levels of film stretch. These types of loads are most likely to be found at smaller distribution warehouse locations or smaller manufacturing locations. With a type B load, each pallet is comprised of three or two different products being shipped to a single location. Type C loads are the worst type of loads to stretch wrap - primarily because no two loads are the same. 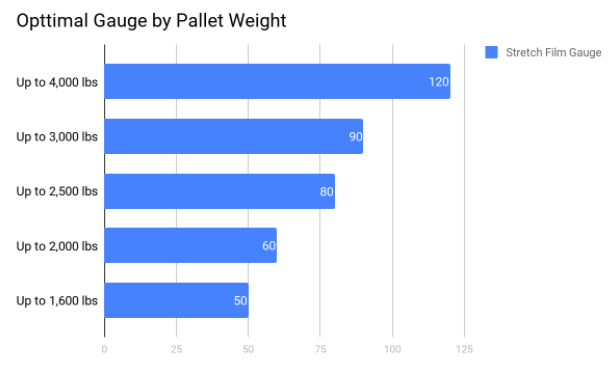 With virtually no uniformity on the shape or size, type C loads can have various sharp points throughout the load and significant differences between the pallet size and load. Although film selection is important with type B loads, it's critical with type C loads. These loads are typically assembled at distribution centers that supply various grocery stores, automotive centers, pet supply stores, etc. Consequently, each load could contain dozens of different products. Use the following bar chart to determine the optimal gauge of stretch film to use based on the weight. Some end users may have special requirements such as colored film, Ultra-Violet Inhibitor (UVI), or one-sided cling. Heavy tinted colored films may be used to conceal the wrapped product. UVI film may be used for products that may be stored outside for longer periods of time. One-sided cling stretch film can be used for pallets that are likely to shift or to bundle. Among the other factors previously mentioned, you should also consider the method of shipment and distance. For example, one type of film may meet the requirements of a product being shipped by forklift across the plant. However, this same type of film may not suffice if the package is being transferred across the country by a rail or flat bed truck. Although the shipping distance and method of shipment are commonly overlooked, these are both important factors you should consider when choosing the right machine stretch film for your application. At AAA Polymer, we talk to customers every day who errantly base their decision to purchase or not purchase a stretch film based solely on the cost of the roll. Although the cost always matters, the true driver is the amount it costs you to wrap the pallet. In the end, it's best to conduct a cost per pound analysis as well as a cost per load to truly evaluate your costs and understand which stretch film is best for your application. Since 1974 AAA Polymer has been helping business owners find the best stretch film for their unique needs. Our experts will conduct an intuitive analysis to determine your cost per pound as well as your cost per load to understand which stretch film is best and most economical for your application. Contact AAA Polymer today for a free stretch film analysis.